← A Silent Cry: The Indigenous Movie Set To Make Waves In 2014 ! October 1 By Kunle Afolayan: Hits Nigerian Cinemas October 1st 2014! October 1, the monumental film from the stables of Golden Effects Pictures, run by ace filmmaker Kunle Afolayan, will be released in all cinemas in Nigeria on Friday, the 3rd of October 2014, with special advance screenings from Wednesday October 1, 2014. FilmOne distribution, the company distributing the movies to the cinemas made this known via a press release. This masterpiece which was directed by Kunle Afolayan, was made with over N200million, and was shot in Lagos and Ondo state for over forty days, after four months on pre-production. The cast of the movie delivered great acting dexterity; veteran actor Sadiq Daba (hit 80’s TV drama series Cockrow At Dawn), Kehinde Bankole, David Bailie, Nick Rhys, Fabian Adeoye Lojede, Kanayo O. Kanayo, Bimbo Manuel, Kunle Afolayan, Femi Adebayo, Demola Adedoyin, Kayode Olaiya, and Deola Sagoe. The movie has been consensually dubbed by movie echelons, pundits and critics to record outstanding box office figures when released in Nigerian cinemas,stemming from its high technical quality output. A grand premiere has been slated for Sunday September 28th, 2014 at the Eko Hotel and Suites, Victoria Island, Lagos. October 1 received production sponsorship from the Lagos state Government, Toyota, Elizade Motors and Sovereign Trust Insurance. According to Mr Kene Mkparu, the MD of FilmOne distribution, “Kunle Afolayan has not faltered in any of his movie productions since he made his directorial debut in 2007. He raises the bar with every movie he produces; Irapada, The Figurine, Phone Swap and now October 1. His filmmaking skills are truly exceptional and we are indeed proud to be the distributor of this outstanding work”. Mr Afolayan believes strongly that there is so much potential for this kind of film and that people will start believing in indigenous film projects after watching October 1. One thing is crystal clear, Nigerians and non-Nigerian alike are waiting enthusiastically for the release of October 1 and will swarm the cinemas to watch the movie that is poised to leave a long lasting positive impression on all who see it. The producer and distributor of October 1 urge all Nigerians and lovers of Nigeria to come out in large numbers to experience this cinematic showpiece. We can’t wait to watch it…what do you think? This entry was posted in Uncategorized and tagged kunle Afolayan, october 1 marches into nigerian cinemas october 1st, october 1 movie by kunle afolayan, october 1 movie hits cinemas in nigeria on october 1st, watch october 1 on independence day. Bookmark the permalink. 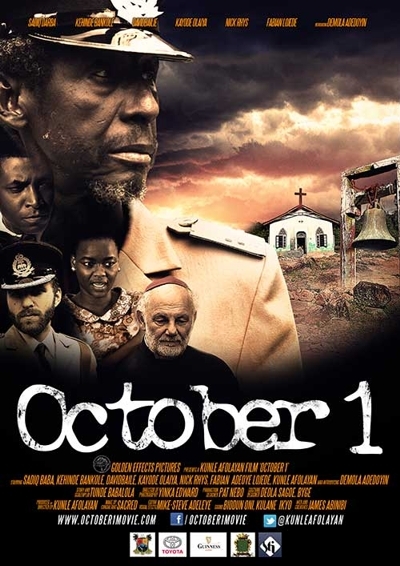 6 Responses to October 1 By Kunle Afolayan: Hits Nigerian Cinemas October 1st 2014! Where in Ibadan will you show the film ? When is the film coming to Ado ekiti?